With water quality in the Chesapeake Bay suffering from excess nutrients and fish populations in rivers such as the Susquehanna experiencing gender skewing and other reproductive abnormalities, understanding how to minimize runoff of both nutrients and endocrine-disrupting compounds from farm fields after manure applications is a critical objective for agriculture. 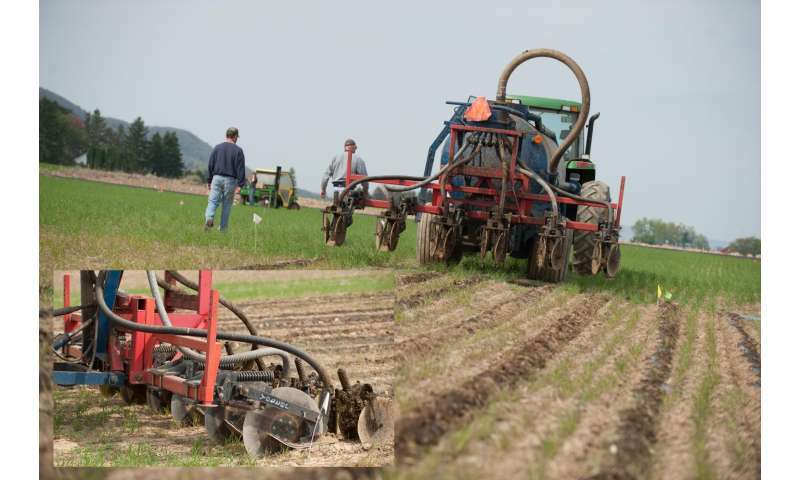 A new study by researchers in Penn State's College of Agricultural Sciences shows that applying manure to crop fields by means of shallow disk injection into the soil rather than traditional surface broadcast significantly reduces estrogens in surface runoff. 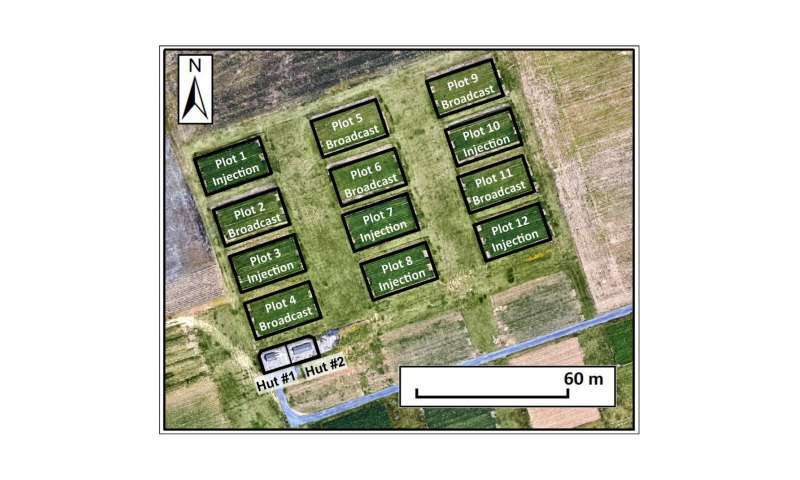 This finding suggests that manure-application methods can be used to control the mobilization potential of estrogens and points to opportunities for protecting downstream water quality. The research, published this month in Agriculture, Ecosystems and Environment, also investigated how manure-application methods affected runoff of total dissolved phosphorus and dissolved organic carbon. Researchers found that transport rates of those nutrients, to a lesser degree, also were lower after manure injection than after surface broadcast. Earlier findings from the study, which was conducted from October 2014 through the summer of 2015, were published in the Journal of Environmental Quality in November 2016. The research sampled 10 surface runoff events from 12 research plots—six with each application method—after the fall application of manure. The application of livestock manure to agricultural fields provides essential nutrients for crops and adds organic matter to soils. However, manure also introduces emerging contaminants to the environment, including the natural estrogens 17 alpha-estradiol, 17 beta-estradiol, estrone and estriol, according to Heather Gall, assistant professor of agricultural and biological engineering. vThe researchers used manure from dairy cattle, but estrogens are a component in the waste stream of not only dairy, but all livestock and humans. Although this study focused on ubiquitous natural estrogens, synthetic estrogens also can affect water quality, such as ethinylestradiol, the active ingredient in birth control pills or synthetic androgens such as trenbolone, often given as ear implants to beef cattle. Many factors influence the fate and transport of these manure-borne hormones, explained lead researcher Odette Mina, a recent doctoral degree graduate in agricultural and biological engineering, including the type of manure applied, the rate and timing of application, the method and history of application, as well as natural drivers such as hydrologic processes and biogeochemical cycling. "The method of animal manure application can influence the availability of nutrients and estrogens to runoff water," said Mina. "Several studies have shown the potential benefits of shallow disk injection for reducing phosphorus and nitrate transport in surface runoff compared to surface broadcasting. Our research demonstrated significantly reduced estrogen transport in runoff from shallow disk injection plots relative to surface broadcast plots." Mina came to the research in an unorthodox way. She got her undergraduate degree in chemistry more than two decades ago, a masters in business administration, and had been working in consulting engineering for more than 20 years before she decided in 2010 to pursue a graduate degree in engineering. She earned a master's degree in environmental engineering at Penn State Harrisburg and joined Gall's lab in 2013. This research took place at the Kepler Farm plots located at the Russell E. Larson Agricultural Research Center in Rock Springs, near Penn State's University Park campus. The site consists of 12 hydrologically isolated plots which direct surface runoff from each plot downslope through PVC pipes to huts near the plots. The huts are equipped with tipping buckets that measure the surface runoff flowrate and allow researchers to collect flow-weighted samples to analyze the nutrients and contaminants in the runoff. Researchers saw a striking difference between estrogen loads and concentrations in runoff following precipitation events, Mina pointed out. When manure was injected into the soil, estrogens were far less likely to leave the field. "We had a rainfall event that happened two days after the manure was applied—it wasn't a big rainfall event, a typical storm that you would expect every year—and it caused a really big movement of estrogens, carbon and phosphorus from the surface-broadcast plots," she said. "But that same event was not enough to even trigger runoff from the plots that had undergone shallow disk injection of manure. That first flush washed off really high concentrations of phosphorus and estrogens relative to the entire rest of the study, but there was nothing from the shallow disk injection plots." On small dairy farms typical of the mid-Atlantic U.S., manure is most frequently applied in the spring and fall, but manure application may occur year round, although some states restrict or ban winter manure applications. Manure is generally applied to corn crops, although other crops also receive manure, including legumes. Adoption of shallow-disk manure injection among farmers has been slow, Gall pointed out, and that mostly results from the high cost of new injection equipment. But the method is compatible with no-till agriculture and has the added benefit of causing less odor. Before she can recommend all farmers transition to injecting manure, Gall intends to do more research. In a follow-on study now being planned, she wants to be sure keeping estrogens out of surface runoff doesn't result in the contaminants leaching into groundwater. "There potentially could be some trade-offs with groundwater quality, so by doing the shallow disk injection you could be promoting more nutrient and estrogen loss into groundwater, perhaps causing localized concerns for people pulling their water from wells," Gall said. "However, at least from a surface runoff perspective, the results suggest that shallow disk injection could be a viable option for reducing both nutrient and estrogen transport to surface water bodies, such as the Susquehanna River and the Chesapeake Bay."